During his -four decade long career, he's penned some of the most memorable songs of all time including Lean on Me, Ain't No Sunshine, Use Me, Just the Two of Us, Lovely Day, and in the process became an authentic American musical icon. Join us as we welcome Songwriters Hall of Fame inductee Bill Withers to The GRAMMY Museum for an intimate discussion and interview. Withers' additional honors include the American Society of Composers, Authors and Publishers (ASCAP) Rhythm & Soul Heritage Award, multiple Million-aires citations from Broadcast Music Incorporated (BMI); a Soul Train Hall of Fame award; two NAACP Image awards, and many more. In 2007, Lean On Me was enshrined in the GRAMMY Hall of Fame. As resounding as the many honors he's received might be, they are eclipsed by the eloquence of spirit that defines the songs he writes. 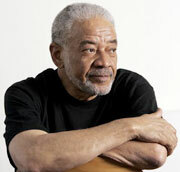 40 years since his debut, Bill Withers' songs echo as vibrant touchstones in the American musical experience. GRAMMY Museum Executive Director Bob Santelli will moderate the event and after the discussion, Withers will take questions from the audience.